If you’re reading this you’ve probably decided to consider purchasing a canister vacuum. In the old days not more than 20 years ago, canister vacuums often could not compare with their more powerful upright counterparts. However, improved technology has reached down into consumer goods even to the humble vacuum cleaner. Currently, if you purchase intelligently, you can find canister models that clean floors and carpets thoroughly, store compactly, are reliable and easy to use in tight spots. Since a vacuum is one of the most frequently exercised of household tools, consider purchasing the best your budget can manage. This is a unit you will use very often and will be expensive to replace. The very last circumstance you want is for your vacuum to die minutes before a houseful of guests arrive. Unlike many cleaning activities, if you do not clean your carpets and floor, people actually do notice. Listed at about $300, the Electrolux UltraFlex Canister Vacuum is an excellent investment. Sleek, light, and attractive, this vacuum is compact but effective. With excellent suction and maneuverability, the UltraFLex does an excellent job of combining the need for powerful suction and mobility. Addressing the oft-repeated criticism that canisters lack the versatility of upright machines, the UltraFlex provides three height adjustments and five power settings so you can adjust the suction as needed. For example, for carpeting, you probably need the highest suction level. For curtains and upholstery, a lower setting is a better match. Many users feel this canister is so strong, even on carpets that you don’t need to keep an upright for backup. Another recurring concern of canister vacuums is that they under perform on floors, but this unit puts that concern to rest as well. This model has wheels on the head to prevent scratching flat surfaces such as hardwood and is designed to work equally well on super plush carpets and bare floors. The head of this machine is super. It spins, twists, curls and moves sideways to fit into all manner of oddly shaped space that might be hiding dirt. Users who have experience primarily with older, simpler machines should become familiar with the instructions and functionality before using. The UltraFlex has more features and adjustments with an accompanying amount of buttons. Many features contribute to the ease of using this vacuum. It is light, about 11.5 pounds, which eases carrying as well as rolling. It is designed with two handles so you can carry it in either direction, whichever is most comfortable for you, which is a thoughtful and insightful feature. The base has large rear wheels to improve mobility. It is equipped with a 21 foot cord and an 8 foot telescoping wand for a remarkable total 33 feet of reach. The more you can reach, the less you have to move, so this is a real labor-saving feature. There is no bag to change and the filters are washable and reusable, saving you both bag and filter dollars. when you are done vacuuming, push the base control to automatically wind the cord. A unique and extremely attractive feature is the brush roll clean technology. This feature self-cleans tangles from the brush by touching a button. This is a real innovation and saves hours invested attaching the brush with scissors and fingers prying long hairs, strings, threads and other various debris from the brush. Another attractive feature is the adjustable suction. How many times have we tried to vacuum the curtains and pulled them off the wall? That is prevented with the adjustable suction feature. Simply decrease the suction for curtains and furniture and the process advances much more smoothly. The suction tube is translucent, which is very helpful when something clogs it, as always happens; the clarity makes dislodging the clog much easier. Storing this powerful but compact vacuum is easy. The base has a small footprint and the super flexible hose can be adjusted to fit into quite small spaces. It also has automatic cord rewind which is are real sore for those of us tied of the unending winding and it makes storage of the entire unit easier. Adding value to this machine, the UltraFlex comes with a set of attachments for which other manufacturers require an additional outlay. The crevice tool and dusting brush store on the handle, ready the instant you require them. The upholstery nozzle is great for all fabric-covered surfaces from sofas to window seats and the included bare floor nozzle attacks those corners where dust and dirt can hide. For storage, the wand attaches to the base and the entire unit can stand upright unsupported. Electrolux is a vacuum manufacturer of excellent repute and long history so concerns about customer support are almost superfluous. The UltraFlex comes with a five year warranty. Also at about $330 is our silver pick the Miele Classic C1 Olympus Canister Vacuum. The Miele Classic is bucking tradition a little with this model in that this is a bagged vacuum. Many people prefer disposable bag vacuums for a variety of reasons. The first is that the dirt chamber does not maintain the vacuum as tightly as a bag and hence sacrifices suction. Additionally, throwing away the tidy bag without opening it means the allergens you diligently eliminated remain contained rather than again exposed to the environment by emptying the cylinder. Another preference for bags over bagless is that grime accumulates inside the collection cylinder. This is more unattractive than a threat to functionality, but it is a factor. Perhaps lastly, the collection cylinder is subject to cracks and breaks which end its productivity. So, though this is not fashionable, Miele might be opposing fashion in favor of functionality. The unit includes a bag replacement indicator which is very useful in that you do not have to open the base and check the bag to see when to replace it. There are also two filters located very near the bag that you must replace regularly. When last listed, a set of bags and filters to maintain the machine for a year cost about $20. This unit maneuvers on three small casters attached to the base unit. Each caster moves 360 degrees so the machine moves fluidly and changes direction easily. This takes flexible movement to the next level. Yes, the base moves readily where ever you want it to follow. However, the interesting feature in the Olympus is how well and fluidly the brush head swivels, turns and twists on the wand. This is a very innovative feature that greatly eases thoroughly cleaning small, tight areas. At about 13 pounds, this is a little heavier than the other top finishers, though many people think the emphasis on weight is misplaced. Most of the time the weight of the unit is traveling on its wheels. For the occasion lifts and carries, a few pounds one way or another are not significant. A selling feature of this unit is the handle-operated toggle for transitioning from floor to carpet. Without bending or changing accessories, as you are vacuuming, you move the toggle for the correct setting for floor or carpet; a tidy solution. The Miele Classic embraces a more traditional shape. Rather than the space-age designs so popular in the canister marketplace, the Miele Classic sports a standard rounded rectangle with bumpers to protect door frames and furniture. The non-marking wheels are an excellent feature to protect hardwood or laminate floors. The Miele comes with three attachments the fit into a handy caddy attached to the base of the wand: upholstery brush, dusting brush and crevice tool. 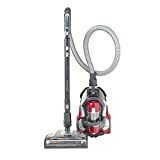 The wand head is illuminated for easy identification of items you may not want to suction into the machine and so you can validate that the vacuum is actually removing dust and dirt from your floors and carpeting. The wand also contains a slider to decrease suction at a moment’s notice as needed. You might use this, for example, if you accidentally moved the wand head over an electrical cord that was resting on the floor. Primarily of plastic composition, the Classic has a stainless steel telescoping wand which you can adjust to your own comfort level. The cord has automatic rewind. The total cleaning radius for this vacuum is almost 30 feet. This model includes three accessories including a dusting brush, upholstery tool and crevice nozzle. For storage or carrying, the Classic is provided with two ways to attach the wand assembly to the base unit; the first enables attachment with the base upright and the second with the base horizontal. This is note-worthy because many canister vacuum cleaners do not stand. The variable speed motor is controlled from the base unit. A switch enables easy movement among the speed settings. The curving lines of the machine are attractive and the base can be stored upright or horizontal to accommodate the intended storage space. The included air filter system traps 99.9% of “lung damaging particles” (quotation from the published product description). The Miele Classic C1 Olympus canister vacuum is not recommended for deep pile carpets. The Dyson DC39 Animal Canister Vacuum Cleaner costs about $300. This bagless unit has the most unique maneuvering technology of the top three canister cleaners. A steering mechanism is installed in a central location on the canister where the tube connects to the base. This mechanism enables quick pivots, turns and about face directional changes in tiny turning radiuses. An additional attribute of this feature is that it enables the base to safely navigate around furniture and door jams. The Dyson uses cyclone technology to move particles from the point of capture to the refuse cylinder. This spinning process is designed to capture and hold a larger percentage of dirt and dust particles. Traditional suction products tend to lose some of the refuse they collect between the collection point and the bag. Having invented this technology over two decades ago, Dyson has continually improved on the concept. This model has reconfigured air channels and improved efficiency for even greater maintenance of dirt particles, allergens and pet hair. There is no bag or filter to replace and the Dyson technology reduces the amount of noise generated by the machine; excessive noise is a long-standing complaint associated with vacuum cleaners of all kinds. The filter is somewhat denser than others of its kind. This means that it takes longer to dry after you wash it and when full compromises the suction. The DC39 has a turbine head controllable from the ergonomically-designed handle. For carpeting, activate the turbine and turn it off for flooring; this placement of the control on the handle eliminates the need to bend over the base unit to initiate changes. The turbine is suction driven rather than mechanized; this indicates that small accumulations of hair or dirt can stop it from turning. The quick correction for this is to manually remove the clogging materials. The design supports this by including a fairly quick brush release that enables the user to entirely remove the brush for cleaning. The Dyson DC39 includes a turbine mini head for removing pet hair and dirt from particularly confined spaces, upholstery, stairs and automobiles and other vehicles. Also included are a crevice tool and fabric head that store on the main tube so no running to the closet in the middle of a big cleaning project for the right tool. The crevice tool has an attractive economic feature. The brush attachment and crevice tool are nested, so it looks as if the crevice tool is wearing a large collar. To use the brush, you simply push it into primary place where is clicks over the crevice wand. Two of the three tools can be stored on the wand using the custom caddy which you can attach to either the upper or lower part of the wand. Rather than having to detach the wand to use the tools, Dyson includes a cool device connection design. Open the very top of the handle and click the desired tool into place. From there, use the attachment as desired. This is more convenient and quicker than detaching the entire hose and wand to use the tools. The distinctive Dyson ball, designed for optimal maneuvering, encloses the essential components of the vacuum. The ball is acoustically treated for reduced noise. The dirt is captured in a clear cylinder enabling you to see how much has been removed from the floors and carpeting and when to empty the container. It also includes an automatically retracting cord. Accidentally vacuum doll shoes or a lucky penny? No problem. The handy suction release on top of the tube releases such mistakes quickly. You activate the suction release by pulling a trigger placed ideally on the wand handle. Our reviewers suggest this machine works best on floors. Dyson has a five year parts and labor warranty. Our Ballin on a Budget pick, the Bissell Zing Bagless Canister Vacuum is yours for about $40, a real bargain. Weighing only 11 pounds, you could carry this all over the house, but as it’s a canister, there would be no point. For optimal filtration, the Zing has an unusual three phase system. Two filters are situated in the dirt cup and a third is placed post motor. All three are removable and washable. So, as we have seen in other models, you do not have to replace either the bags or the filters. The Zing is advertise for multi-surfaces, but our reviews recommend it for floors or other hard surfaces only. The wand head has a toggle to adjust for floors or carpeting. Bissell sells this model with a combination crevice tool/dusting brush. The crevice/brush firmly, conveniently attaches to the wand head; it is not likely to dislodge during regular use. A cool, under-reported feature is that the wand snaps onto the base so the unit can be stored standing upright or the two parts can be detached if storing in the arrangement is better for you. This is an unusual feature. Many canisters do not stand up unsupported. It has automatic cord winding and an air flow regulator. For easy progress on the floor, the Zing has two large rear wheels and a small, centrally-placed third wheel. Our reviews felt this was an adequate adaption for moving on flat, hard surfaces such as wood or tile, but inadequate for carpeting. For a smaller investment than you would spend on a hand held vacuum, this is a good choice. There is no brush on the intake head, so it is not equal to any kind of fabric or carpeted surface. The dirt cylinder is divided into an upper chamber for small particles and a lower for larger, though Bissell does not explain this design choice. No bells or whistles, but substantial suction in a lightweight package. The Bissell is backed by a one year limited warranty. Contact Bissell with any questions, concerns or comments: 1-800-237-7691. The Bissell website is: www.bissell.com. There are two types of vacuums on the market for large scale floor and carpet cleaning: upright and canister. For small places, many people make do with brooms, mops and other non-technical cleaning apparatus. However, for entire houses or apartments, these compromises are not appropriate. Consequently, performance is the number one pre-purchase consideration without question. Though we always present options understanding that each of us has a budget to respect, the gold pick in this category is clearly the best unit. Unlike many products we review, a vacuum cleaner is not a “nice to have” but a front line cleaning and maintenance necessity. Try skipping vacuuming for a few days; your place looks instantly poorly kept. Your carpets and floors last longer, dirt is not stamped all over the house, and babies are not crawling on the grime from the streets with simple, regular vacuuming. Yes, the top recommendations in this review are expensive, but that is partly because many of us have become used to “disposable” models that cost a third of the price and last about three years. Push your budget to its realistic end to purchase the best vacuum you can afford. It will repay you in reliability, length of service and customer support. The key reason buyers consider canister vacuums over upright is for their portability; in this is included both the ease of moving the canister from place to place but also the ease of reaching into places that are less accessible to upright machines. Clearly, the key attraction of canister machines lies in these two facilities. However, objective portability is not of primary concern. Portability, as it applies to your specific living situation, is most important. When considering different models, picture your layout; recall to mind particularly challenging vacuuming areas; will the model you are considering address your current challenges? Picture your staircases; these are the bane of the vacuumer’s art. Is the hose on this model long enough for you to reach all the stairs without balancing the canister on one of the risers? Examine the wheels of the canister. You are considering a substantial investment; you should get quality wheels that swivel and don’t collect dirt as they pivot on the carpet or floor. Pull the model around on the shop floor without embarrassment. If you purchase this unit, you will be pulling it for years. If you don’t like the way it moves in the store, odds are you won’t like the way it moves in your home. Lift the canister and walk with it. Is it well-balanced? Even the highest rated machine might not be a great match for you because of your size and strength. Taller people can generally carry more easily. A rounder more compact canister may be easier for you to move than a longer narrower one. Carry the hose portion with you as you will when working at home. Honestly, carrying any vacuum is generally a challenge, but some manufacturers create designs that limit the irritation and tedium of this process. Test as many as you can until you find the best match for your frame, strength and size. All of these factors are part of the portability of which canisters are so proud. Give each model you are considering a real test and complete review before investing. Your relationship with your vacuum is a long-term one; we want it to be as fulfilling as possible. The bag vs. bagless argument has been going on ever since the pioneer bagless models arrived on the scene. There are more complexities to this issue than you might initially realize, so pointing out a few here may illuminate the advantages of each. Of course, bagless unites tend to be less expensive to run because, surprise, you don’t have to constantly purchase bags. Associated with this convenience is that you will never be prevented from finishing a vacuuming project because the bag is full and you don’t have any replacements in the house. This is a clear advantage. However, when you empty bagless canisters, some of the debris you vacuumed generally reenters the atmosphere; the amount is usually not substantial, but it does happen. Bagless units may have tricky release mechanisms. After a dozen uses or so, you will no longer notice this. However, consider this function when you test the units. Make sure it looks sturdy and long-lasting. You will need to empty the unit each time you vacuum at least once so it must be a reliable system. Additionally, hair and strings sometimes wrap around the interior of the bagless units. This means you have to fish in the cavity to pull release the blockage; this is an unattractive responsibility. Bagged canisters have advantages as well. There is a feeling that because you close and immediately remove the bag, you prevent the instant return of allergens to the house. This is very important in homes with people with severe allergy burdens and a moderate concern for people otherwise. Additionally, bags tend to hold the contents securely; you don’t see flotsam and jetsam trickling around the garbage container when you dispose of them. Bags are a recurring expense. We have found that, though manufacturers and aftermarket producers work to make vacuum bags standardized and available in every corner store, this does not always happen. Yes, we should all plan ahead and keep a sizable supply of bags on hand so we don’t run out; in reality, many of us purchase three-bag packages and think they will last forever. Be sure to consider your situation and personal preference for bags or bagless before you purchase. You are making a substantial investment; make sure your manufacturer is supportive of their products. Unlike many other aspects of this purchase, this is not something you can test out on a shop floor. However, the preponderance of public review platforms enables some access to users with experience working with the manufacturer. These reviews are subjective, but if you invest some time in reading a wide variety of review, you will develop an idea of the kind of support you can expect. Look at the warranty information. Do you have six long-haired cats and a collie? Yours is an above average environment vacuum challenges. You may want to consider all the extended warranties you can. If you are a canister vacuum person, we have found and reviewed several strong options. All have filtering to maximize allergen removal, but the bagless options somewhat counter this design element because you release most of the contaminants back into the environment when you empty the dirt. There is only a small weight difference among the units reviewed, so that is should not be a real consideration in your purchase. The gold, silver and bronze finds all have substantial suction, but none are equal to a standard upright for carpet and soft surface vacuuming, though excellent on hard flooring. As for product support, the Bissell reviewers were the least positive in their judgement of customer and product support. A factor that we can not account for in the hazy customer support topic is determination and persistence of the user. Clearly we all know people who keep knocking until the door opens and keep asking until they hear the word “yes”. It is probable that those users were satisfied with the service and simply did not choose to review. None of the vacuums have wonderful warranties, though all manufacturers state that they stand behind their products. If you want a canister for your space and know it to be a good match, this review will assist you in making a good choice within budget.